American and Brazilian cancer researchers have succeeded in stabilizing and shrinking inoperable liver tumors with radiofrequency (RF) radiation that is no more powerful than that emitted by a typical cell phone. This is "exciting" news, said Boris Pasche of the University of Alabama medical school in Birmingham. Frederico Costa of the University of São Paulo medical school, Pasche's collaborator, agrees. "We observed significant tumor shrinkage in 10% of patients," he wrote in an e-mail to Microwave News. Costa points out that this is five times the success rate of the best available chemotherapeutic drug —Sorafenib —and that "there are essentially no side effects." Costa and Pasche's new findings were published by the British Journal of Cancer last week. (The paper is open access.) Costa is the director of clinical research at the Brazilian Institute for Research on Cancer in São Paulo. Pasche is the director of the Division of Hematology and Oncology at the University of Alabama School of Medicine. Liver cancer is a massive public health problem. It is the second most frequent cause of cancer mortality among men worldwide; for women, it is the sixth leading cause of cancer death. In 2008, there were approximately 750,000 new cases and close to 700,00 deaths around the world; half of these were in China, according to the most recent statistics. Not only could this new therapy, called TheraBionic, revolutionize the treatment of liver cancer, it might also stimulate new respect for electromagnetic medicine, as well as prompt a major reevaluation of electromagnetic health risks, most especially with respect to the safety of cell phones. Patients with liver tumors, hepatocellular carcinoma (HCC) that cannot be completely removed during surgery have a very poor prognosis. Their average survival time is just three to six months. While the median overall survival of the 41 patients in Costa and Pasche's treatment group was only somewhat longer (6.7 months), eight of their patients had a remarkable response. Six of the eight went on to live for more than two years —four of them for at least three years. Notably, five of the six long-term survivors had tumors that were actively growing when they began receiving RF therapy. One of these five, a 76-year old woman, was still alive and being treated close to five years later. Four (9.8%) of Costa and Pasche's 41 patients with terminal liver cancer saw the size of their tumors decrease by at least 30%. By comparison, in a similar trial using the drug Sorafenib, only 3 of 137 patients (2%) showed the same level of tumor response. In all, eight of the patients receiving RF therapy either saw their tumors shrink or they survived for longer than two years, or both. The RF therapy also helped many of the patients who were in pain. Of the 11 patients reporting pain before entering the trial, five said that it completely disappeared and two said that it decreased soon after treatment began. There was no change for two others; two complained that there was more pain after treatment. One clear inference from the trial is that some patients were much more responsive to RF therapy than others. The reasons why are unknown. Pasche explained that all sorts of different people fared better, without any obvious traits in common. "Both men and women, Caucasian and non-Caucasian, patients with hepatitis B, hepatitis C or no hepatitis infection responded to the therapy," he said. Even though Pasche and Costa don't have a mechanism in hand to explain how the radiation can control the growth of the tumors, they state that their "novel therapeutic approach does not depend on temperature changes within the tumor." TheraBionic treatment uses a device that looks like a spatula connected to a box that's only a bit bigger than an iPhone. The spatula is a stainless steel antenna that transmits 27.12 MHz amplitude modulated (AM) radiation generated by an amplifier inside the box. Patients put the antenna in their mouths, much like they would a lollipop, for one hour, three times a day. It's so unobtrusive that they can read a book or watch TV at the same time. Treatment can be done at home and does not require hospitalization. The maximum specific absorption rate (SAR) is less than 2 W/Kg, averaged over 10 g of tissue in the mouth near the antenna. It is much, much lower inside the tumor. Pasche estimates that the dose to the cancer cells is 100 to 1,000 times lower than that from a cell phone. "When you take the mouthpiece and put it in your mouth, the body becomes an antenna —the whole body receives a tiny but fairly homogeneous amount of RF," he says. The RF dosimetry was carried out by Niels Kuster of the IT'IS Foundation in Zurich. Kuster, a coauthor of the new paper, could not be reached to learn more details on the SAR within the tumor. The key to the new therapy appears to be a cocktail of frequencies riding on the 27 MHz signal. 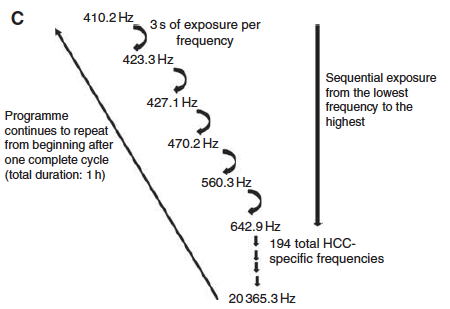 Over the course of the one-hour treatment, the RF generator runs through 194 different modulations, beginning with 410 Hz and rising to 21 kHz. Each one lasts three seconds. At the end of the cycle, the sequence repeats itself (see diagram below). "We believe this treatment has great potential and will be explored for other types of cancer," Costa said. He described how one of his patients with breast cancer, metastatic to the adrenal gland and bone, had a "complete response" after an 11-month treatment. The woman received a different set of frequencies, though they were in the same range (100 Hz to 21 kHz) as those used for liver tumors. The relative efficacy of the 194 HCC frequencies will be tested in an upcoming study, Costa said. This trial, which will be run in Brazil and the U.S., will include 272 patients, randomly assigned to one of two treatment groups: One will get TheraBionic signals and the other randomly chosen frequencies. Costa and James Posey of the University of Alabama are co-principal investigators of the new study. If these trials are successful, the next step would be to get U.S. Food and Drug Administration (FDA) approval for widespread use of TheraBionic therapy. "We have already discussed this with the FDA," Pasche said, "and the protocol has been revised and approved by the agency." In addition, Pasche is running both cellular and animal studies in his lab at the University of Alabama, using exposure systems designed by the university's Department of Radiation Oncology and Kuster's group in Zurich. Pasche declined to give details, but did offer that cancer cells are sensitive to specific modulation frequencies. He said that a paper has been submitted for publication and is currently under review. Fifteen years ago, Pasche developed a treatment for insomnia —low energy emission therapy LEET)— which in many ways is similar to the new RF cancer therapy. While using the same 27 MHz carrier frequency and delivering the RF energy with the same type of lollipop antenna, the sleep therapy used AM frequencies that are in the ELF range between 2 Hz and 200 Hz. (For a detailed report see: "Athermal RF Successfully Treats Chronic Insomnia," MWN, M/J96, p.7). LEET failed to win a following and is not currently in use, Pasche said.